Millions of U.S. fathers don’t live with their children. A new study suggests those who are behind in child support see their children less often, work fewer weeks per year and are more likely to have children with multiple partners. The issue: In fiscal year 2015, U.S. parents paid a total of $32.4 billion in child support through the federal Office of Child Support Enforcement to help pay for the care and raising of their children, according to a 2017 report to Congress. Parents who don’t live with their children often are required to make payments to the parents who do. When the parent sending child support falls behind on payments, there are consequences, including civil and criminal penalties. Depending on the state they live in, they also risk having their driver’s license, professional license or recreational license restricted, suspended or revoked. In late 2016, the Texas Attorney General’s Office began blocking delinquent parents from renewing their vehicle registrations. A parent’s failure to pay child support also has consequences for children, who rely on the money to cover the costs of such things as housing, food and clothing. Research has found that child support helps enhance children’s lives in other ways. For example, a 1999 study published in the journal Demography indicates that child support is linked to higher academic achievement. An academic study worth reading: “Indebted Relationships: Child Support Arrears and Nonresident Fathers’ Involvement with Children,” published in the Journal of Marriage and Family, February 2017. Study summary: Kimberly J. Turner, a research scientist at the non-profit organization Child Trends, and Maureen R. Waller, an associate professor of policy analysis and management at Cornell University, teamed up to examine the link between child support debt and paternal involvement. The authors assert their study is among the first to use national data to investigate whether fathers who don’t live with their children are less likely to spend time with them and offer in-kind support. For the study, Turner and Waller used data from the Fragile Families and Child Wellbeing Study, a longitudinal survey of 4,897 urban families with children born between 1998 and 2000. Mothers and fathers were interviewed at 75 hospitals in 20 cities shortly after their baby’s birth and then interviewed one, three, five and nine years later. The authors focus on data related to father involvement and child support at the time the children were 9 years old. Their study sample consists of 1,017 fathers who did not live with their children. 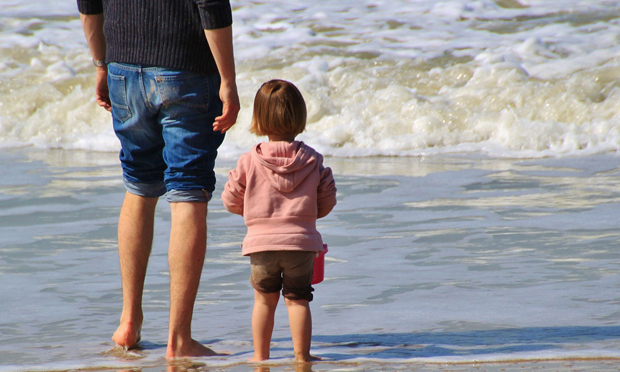 More than 30 percent of fathers owed back child support in amounts that averaged $7,705. Fathers who owed child support worked less often. They worked an average of five fewer weeks per year than fathers who were not behind. They also had lower levels of education and were more likely to have been incarcerated and to have children with multiple partners. Fathers who were behind on their child support were less involved with their children. They saw their children three fewer days per month, on average. They also were less likely to be involved in daily activities such as helping with homework, reading books with their children and playing outside. Fathers who were in arrears provided less in-kind support such as clothing, toys and medicine. Three factors may help explain the link between child support arrears and lower paternal involvement: the quality of the father’s relationship with the mother, the number of weeks he works per year and his mental health. The National Conference of State Legislatures tracks state-level policies related to child support and child support enforcement. The federal Office of Child Support Enforcement offers a variety of reports and data related to child support collection and debt. A 2016 report from the U.S. Census Bureau estimates that custodial mothers received 67.5 percent of the child support that was due while custodial fathers received 74.9 percent of the child support owed to them. A 2015 study published in the Journal of Family Issues, “Child Support and Subsequent Nonmarital Fertility with a New Partner,” indicates that mothers with more child support income are slightly more likely to have a child out of wedlock with a new partner. A 2005 study in the Journal of Policy Analysis and Management, “Declining Employment Among Young Black Less-Educated Men: The Role of Incarceration and Child Support,” suggests that incarceration and child support enforcement account for at least half of the decline in employment among black men ages 25 to 34. Citation: Turner, Kimberly J.; Waller, Maureen R. “Indebted Relationships: Child Support Arrears and Nonresident Fathers’ Involvement With Children," Journal of Marriage and Family, February 2017. doi:10.1111/jomf.12361.